Kristin went in for a check-up on Friday because she was still experiencing severe pain in her lower abdomen and discovered that she had not actually lost the baby yet; that it was in fact, an ectopic pregnancy. The doctor sent her to the ER immediately and they performed emergency surgery. 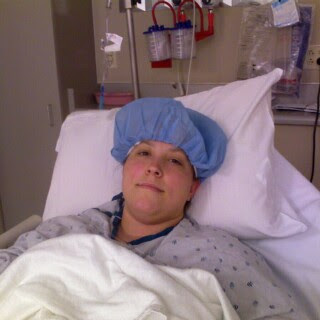 Two and a half hours and three incisions later, she was moved to the recovery room. Along with a couple of other procedures, they had removed one of her Fallopian tubes; there was no way to save the baby. The drugs must have been pretty good because she was in the recovery room for 3 more hours and I couldn't get her to leave. Just kidding. The anesthesia caused severe nausea so they wouldn't let her leave. She is now at home and will not be allowed to return to work for a few weeks. We would appreciate your continued prayers. We are still believing that God has a plan and that everything happens for a reason. God is so good to us.